MOUNT OLIVE – University of Mount Olive (UMO) student service group Sisterhood of Crown and Martlet (SOCAM) raised $1120 for the Southeastern Cancer Care (SCC), a local organization based in Goldsboro that assists cancer patients and their families in eastern North Carolina. Services provided by SCC include basic living essentials such as gas cards, food cards, utility payments, prescriptions and more. SOCAM’s 8th annual fundraiser, “Sing For Another Day,” included performances by UMO students, faculty, staff, and alumni. Oncologist Dr. James N. Atkins spoke at the event. He shared information about how SCC was founded, and what the organization does for cancer patients in eastern North Carolina. SOCAM members collected event sponsorships, held a bake sale, and sold Cures for the Colors t-shirts as part of their fundraising efforts. “With much dedication and support, we were able to surpass our expectations. We are overjoyed to know our efforts will benefit the communities around us,” said Andrea Palos-Jasso, Vice President for SOCAM. 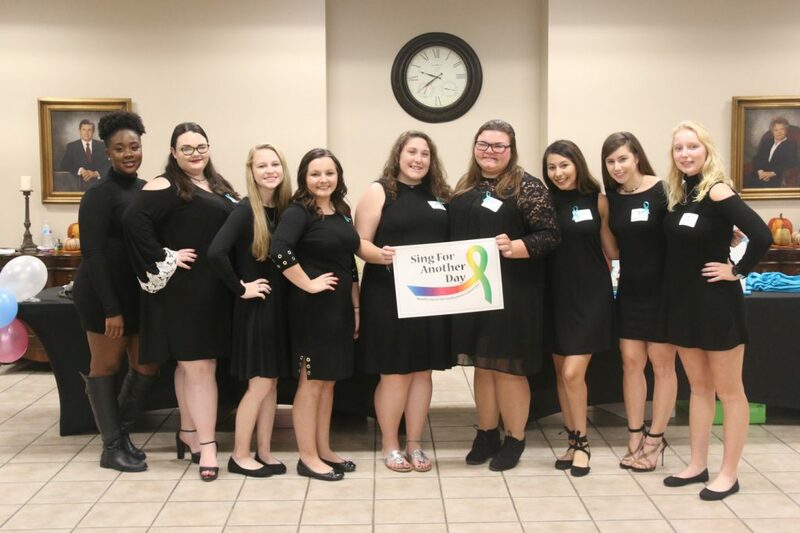 SOCAM Secretary MaKayla Hackney said, “It was an honor to be able to be a part of such an impactful event that raised money for local families in their time of need.